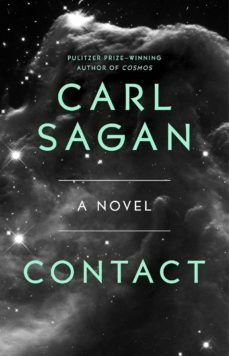 The Pulitzer Prize-winning author of Cosmos and renowned astronomer Carl Sagan’s international bestseller about the discovery of an advanced civilization in the depths of space remains the “greatest adventure of all time” (Associated Press). The future is here…in an adventure of cosmic dimension. When a signal is discovered that seems to come from far beyond our solar system, a multinational team of scientists decides to find the source. What follows is an eye-opening journey out to the stars to the most awesome encounter in human history. Who—or what—is out there? Why are they watching us? And what do they want with us? Tal vez no sea una obra innovadora ni con pretensiones estilísticas, pero con este libro Sagan consiguió interesarme - e incluso emocionarme - haciendo gala de un oficio nada desdeñable del que deberían tomar ejemplo otros divulgadores metidos a novelistas (como el perpetrador de "El ángel perdido", por citar un ejemplo). Filosofía, ciencia, especulación fundamentada y un personaje central maravillosamente construido, coherente y creíble. Una buena ciencia ficción alejada de los clásicos extraterrestres. Con buenas conversaciones sobre la ciencia y la fe en Dios.